You can find great looking patio furniture without breaking your budget. There are lots of styles available at affordable prices. 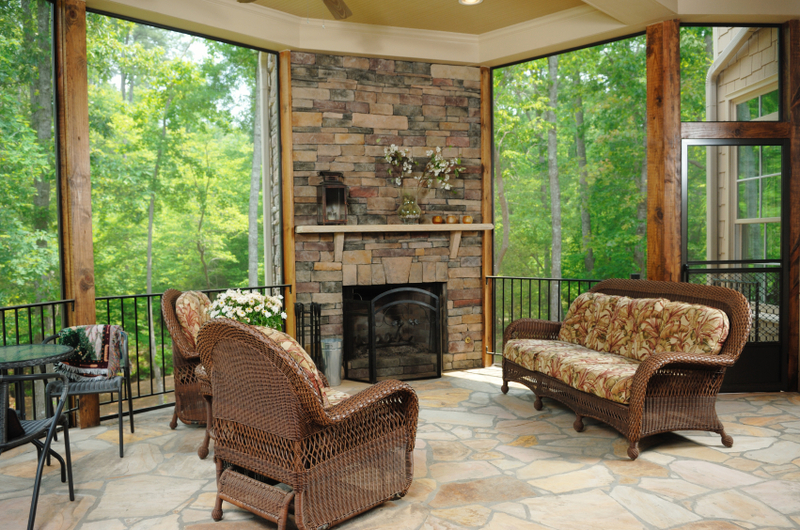 Treat your patio like an outdoor room and be sure to accessorize. One of the best choices is to add some potted plants and flowers for a true relaxing garden ambiance. Take your love for Mission Style outdoors with this pair of Strathwood Gibranta All-Weather chairs. Made from FSC certification (Forest Stewardship Council®) eucalyptus hardwood. Wood naturally seasons to gray or you can apply teak oil prior to using to maintain new wood look. An Amazon.com exclusive, you can also purchase the matching coffee table and two- or three-seater bench. This 3-pc rattan furniture set features a hand-woven diamond pattern using a commercial grade, polyethylene resin rattan material. Available in an a rich espresso color. The chairs and table is fade resistant to UV (Ultra Violet) light and protected against weather, salt (ocean) and chlorinated water (pool). Sturdy lightweight steel frames are collapsible for easy storage. Chairs: 18.5" seat, 17" deep and 32" high (to back). Strathwood Rawley offers this 2-pc set of swivel armchairs. The cast-aluminum frames are finished in a brown powder coat. Textilene® (synthetic fabric of polyester and PVC) geometric fabric covers the seat and back. While there is some assembly required for the coffee table, all other pieces in the set are shipped fully assembled. Strathwood Basics offers this brown and champagne colored anti-gravity recliner. The steel suspension frame features multiple leg and back positions to ensure you find the perfect position to relieve muscle tension. The seat is made out of Textilene® (synthetic fabric of polyester and PVC). The seat fabric is attached to the steel frame with bungee cords for ideal suspension. 4 Chairs: 24.5" wide x 22.625" deep x 37"
Glass top table: 32" x 32" x 27-3/8"
The chairs are made of steel and are a sling fabric style. Chairs and umbrella fold. * Umbrella stand is sold separately for $38.29. This natural wood tete-a-tete seat offers generous seating with natural hardwood slats. A matching wood slat triangle center tray is ideal for holding a couple of mint juleps on a hot summer's eve. Wood slats are finished to be weather resistant. The ball bearing suspension gives each glider a smooth and silent rocking motion back and forth. The textured steel frame is finished with a bronze powder coating. This Merry Garden Adirondack is a beautiful rendition of the classic design that brings to mind summer nights in the cool Adirondack Mountains. Made from solid fir wood, the chair is decay and rot resistant. Metal pin and solid hardwood construction for the frame give a stable weight capacity of 300 pounds. Can be left natural, painted or stained. Matching ottoman available as separate purchase. This popular 1960s classic is offered by Crosley Furniture in a "grasshopper green" (other colors available) with a non-toxic power-coated finish. The Griffith metal outdoor furniture captures an era when cocktail parties were all the rage. Grab a couple of these steals for your patio. Imagine sipping sip tall glasses of iced tea or an afternoon cocktail for a nostalgic evening reminding you when life was less complicated. Now that you have explored inexpensive patio furniture options, check out some cheap patio covers to protect your investment.